I’m in full-tilt Christmas mode right now. I can’t wait to shower the house in festive sparkle. I know some of you are nowhere near ready to consider Christmas yet… If that’s you then I’m sorry and I suggest you don’t come around here for the next few weeks ha! 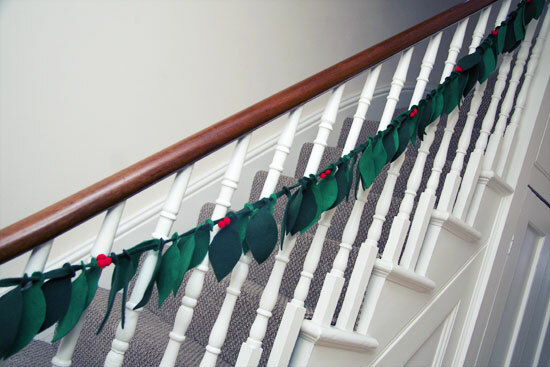 My latest festive project is some felt garlands to decorate the staircase. I knew I wanted to make a garland using felt but wasn’t sure how to go about it. 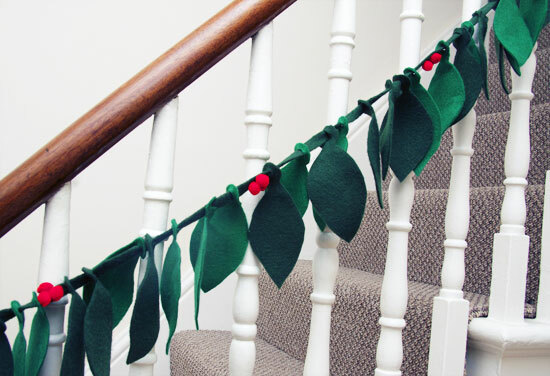 I turned to Google and of course found that lots of people have attempted felt garlands. I found this great tutorial for a simple felt garland inspired by some Anthropologie christmas decor. I made two of these, one for each flight of stairs. So simple! The cutting out took a few solid hours but it’s basic snipping that you can totally multitask. I’m really enjoying felt craft at the moment. Using felt means you don’t need to sew around edges and can throw together some super sweet projects all in the space of a naptime. I see more felt projects in my future.